Garmin zumo 550 Europe designed for bikers, features a superbright sunlight readable glove-friendly 3.5-inch display with preloaded maps for Western and Eastern Europe a full 8-digit UK postcode search. The Garmin zumo 550 Europe also features twin Bluetooth connection for hands free calling, in-helmet voice guidance and to listen to music with the zumo's MP3 player. The Garmin zumo 550 Europe also includes automotive in-vehicle mounting options, allowing you use the zumo 550 in your vehicle as well as your bike. The Garmin zumo 550 Europe also provides access to speed camera locations. Garmin zumo 550 has been discontinued. Accessories are still available for your Garmin zumo 550 click here. Customise your ride with the rugged Garmin zumo 550 Europe. Designed by bikers, zumo's motorcycle-friendly features make it easy to operate while in the saddle. From back roads to rallies, its preloaded with detailed street maps for the UK, Ireland, Western and Eastern Europe (42 countries) and high-end navigation features give you the freedom to go where you want. Garmin zumo 550 Europe comes ready to go right out of the box with preloaded City Navigator NT street maps and a massive points of interest (POIs) database, including hotels, restaurants, fuel stations, ATMs and much, much more. Simply enter a destination, and Garmin zumo 550 Europe takes you there with turn-by-turn voice directions that speak street names and places. In addition, Garmin zumo 550 Europe accepts custom points of interest such as school zones and safety cameras and lets you set proximity alerts to warn you of upcoming POIs. The Garmin zumo 550 Europe also comes with a rechargeable, removable lithium-ion battery a for trip planning or use on foot, and even accepts additional maps. Garmin zumo 550 Europe can receive optional subscription free TMC traffic alerts (in select European counties) when used with either the GTM 12 FM TMC traffic receiver (motorcycle or in-car) or the GTM 21 FM TMC traffic receiver (in-car only). Once connected simply press a button on the screen, and the Garmin zumo 550 Europe recalculates your route to avoid traffic jams or congestion. With Garmin zumo 550 Europe's Bluetooth wireless technology, you can talk on the phone safely without removing your gloves or helmet. Connect the Garmin zumo 550 Europe to your Bluetooth-enabled headset/helmet and cell phone to make and receive hands-free calls whilst on the move. You can even make phone calls to POIs such as restaurants or hotels through Garmin zumo's Bluetooth interface. In addition, Garmin zumo 550 Europe transmits navigation voice prompts to your headset so you can listen wirelessly. Garmin zumo 550 Europe makes it easy to plan your next trip and share routes with your riding buddies. Plan trips on your computer before you start, with the City Navigator Europe mapping provided on CD ROM. Search for food and fuel stops and local attractions. Then, transfer your route to the Garmin zumo 550 Europe and go. At the end of the day, share your favourite places and rides with other Garmin zumo riders, and review your travels in Google Earth. SD card expansion makes it easy for storage and route sharing. Download routes to share with your riding buddies - even load mp3 files to your unit to enjoy tunes on the road. In addition, JPEG picture viewer lets you share photos of your adventures with friends and family. The Garmin zumo 550 Europe, like all Garmin sat nav's, gets its speed camera data from the Cyclops speed camera database. The database provides advanced alerts to fixed, average speed, mobile, variable, temporary roadwork, red light and red light speed cameras. As you approach a camera, your device sounds an alert. Subscription charges apply. Click here to read more about the Cyclops speed trap database. Cardo Scala Rider headsets are available to pair with your Garmin zumo 550 Europe. The benefits of buying and using a Scala Rider headset with your Garmin zumo 550 Europe are three-fold; 1. you can listen to sat nav voice turn-by-turn instructions, 2. listen to music and 3. communicate with other motorcyclists whilst riding (using the intercom when within range and mobile phone when out of range). Garmin zumo 550 Europe is secured to your motorcycles handlebar using the supplied RAM mount and Garmin motorcycle mounting bracket. In addition the Garmin zumo 550 Europe also comes complete with automotive suction mount and vehicle power cable, enabling you to install and use the Garmin zumo 550 Europe in your car as well as your motorcycle. The Garmin zumo 550 Europe is preloaded with City Navigator® NT the UK, Ireland, Western and Eastern Europe (42 countries) provided by NAVTEQ. NAVTEQ maps provide high quality detailed street level maps, which in addition to street information include features such as route calculation, Points of Interest (POI), Estimated Time of Arrival, and more. Further Garmin zumo 550 Europe maps are available SD card which insert directly into the Garmin zumo 550 Europe. 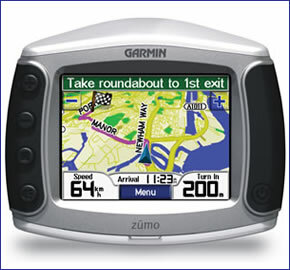 Available Garmin zumo 550 Europe maps include North America, Australia and New Zealand, Middle East and Southeast Asia. Click here to view. Want to fit and install your Garmin zumo 550 Europe motorbike sat nav on a second bike? You need to buy the RAM mount kit and motorcycle power cable. The Garmin zumo 550 Europe was preloaded with street-level road maps for Western Europe. If however, you want to take the zumo 550 further afield, we may have the map that you need. Garmin zumo maps available include: USA, Canada and Mexico, Australia and New Zealand, Morocco and Southern Africa. Question: I would like to update my zumo 550 sat nav for the motorbike. At present Garmin Express when connected, always comes back no updates? So my question is do you post out a sd card or micro card with the maps on? Answer:Garmin Express provides software and firmware updates for your Garmin zumo 550. It does not provide new/updated maps. Purchase the latest and comprehensive range of maps for your Garmin zumo 550. Question: Would like to purchase the up-to-date map for UK for my garmin zumo 550? Answer: You can purchase the very latest Garmin City Navigator (street-level road) maps of UK and Ireland for your Garmin zumo 550 online from our website. Question: I have been bought a Garmin Zumo 550 sat nav, with no attachments whatsoever, I need a compatible handlebar mount, a power lead for the bike and a means of connecting it to the computer for map updates. Please advise exactly what accessories I need. Follow up question: Thank you for the information, but I am still puzzled, There is no socket on the Zumo 550 for either a mini or Micro USB cable. There is only the multipoint connector on the bottom and a small power socket. Where does the USB connector connect. Subsequent answer: The zumo 550 uses a mini USB cable the cable plugs into the underneath of the zumo 550. You need to open the hatch to reveal it. Please page 7 of the zumo 500/550 PDF manual. Question: ZUMO 55O, DO YOU HAVE SPEED CAMERA DOWNLOADS FOR THIS MODEL AND WHAT PRICE PLEASE. Answer: Whilst we sell the latest maps for the Garmin zumo 550. Only Garmin sell downloads such as POI databases including speed cameras. Question: Very interested in your Garmin SD card (plug n play) map updates. Can you tell me if your full size SD card will override my existing mapping (a bit of a mess), without resorting to visiting the Garmin website (a minefield), my device was purchased 2006, it is a Zumo 550 Atlantic in perfect condition. As I say, the Garmin website is a nightmare for me, and I have been unable to achieve any result. Answer: I presume you are referring to Garmin City Navigator NT Maps of UK and Ireland microSD/SD card? These maps, like others that we sell are preloaded on SD card which is then inserted into the zumo 550 SD slot card. The mapping isn't actually transferred to your zumo 550, rather the map data is drawn by and displayed on your zumo 550 motorcycle sat nav. While the mapping on SD card is plug-and-plug and technically a PC isn't required to install these maps. You will need to ensure you have the very latest firmware update on your zumo 550 (available for free from Garmin's website as a download), this will ensure the maps are successfully read by your zumo 550 sat nav. Question: The on/off rubber button on my Garmin Zumo 550 has perished; is there a replacement available, please? Answer: For a repair of this nature you will need to contact Garmin UK on 0808 238 0000 or via Garmin's website. Do you have a question about the Garmin zumo 550? Submit your question via our contact page.